Henoko Bay - Looking at the Camp Schwab site from Henoko Bay beach. December 2011. Photo by the author. In 2003, three Japanese citizens, six U.S. and Japanese environmental associations along with Okinawa residents on behalf of the dugong as plaintiffs filed a claim against the U.S. Department of Defense at the U.S. District Court in northern California. 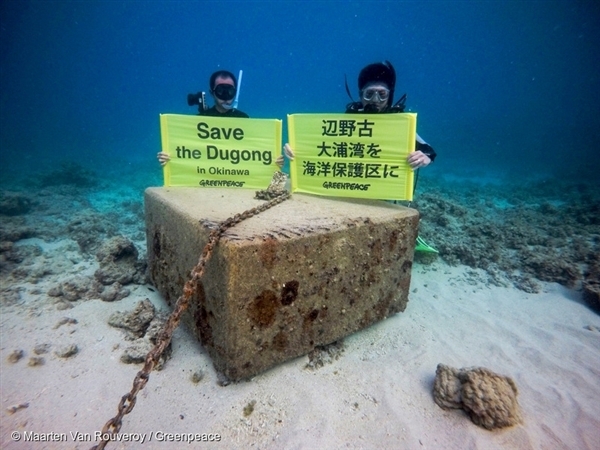 The plaintiffs claimed that the U.S. Marine base construction scheme in Henoko Bay would destroy the habitat of marine mammals like the dugong. For local Okinawa residents, the dugong has been integral part of their cultural and historical heritage, and the planned military facility would violate the U.S. National Historic Preservation Act and the Administrative Procedure Act. This military facility was planned to replace the existing and controversial military base in Futenma as the location is within residential areas and some accidents had plagued residents for a long time. This replacement plan, however, met strong opposition from environmental activists and Okinawa people in general partly because of the impact on the dugong. They also opposed because Okinawa people had been overburdened by American military presence for too long. In 2008, the judge of the district court dismissed the standing of the dugong in this case, but mostly agreed with the plaintiffs' argument, ordering the DOD to conduct proper impact assessment prior to the commencement of the construction. Prime Minister Shinzo Abe and his cabinet, however, are now determined to continue construction despite the strong opposition from residents. The newly elected Okinawa prefecture governor has strongly acted against this Henoko plan, sharply confronting with Abe and Chief Cabinet Secretary Suga. The dispute has not been resolved yet. In April 2017 the Japanese government started building seawalls in Henoko Bay. 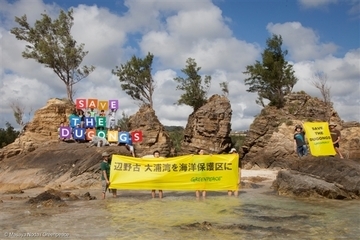 On October 25, about 60 kayaks paddled out in the bay with signs and slogans such as “don’t destroy the sea”. 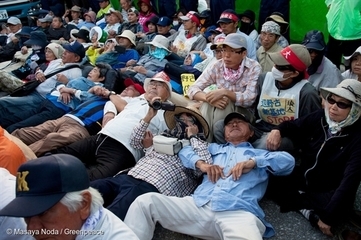 On land, people of Okinawa have participated in sit-down and lay-down peaceful protests (Asahi Shinbun 2017a). Despite strong political opposition by the Okinawa government and activist resistance through community groups and larger organisations like Greenpeace Japan, On 6 November 2017, the central government began construction for two more seawalls in Nago, in an attempt to reclaim more of the area for the base expansion. The Okinawa prefecture government wants to see the military base leave Okinawa all together, but the central government is determined to carry on with their plan of filling this sea area in the autumn of 2018 (Asahi Shinbun 2017b). The Okinawa government filed a lawsuit against the central government in July of 2017 against the expansion of the military base, however it is still pending and the project is continuing as planned (Kyodo News 2017). Apart from the endangered Dugong, there are other environmental issues that are worth mentioning in regards to this case. A survey conducted by the Environment Ministry revealed that 70% of the coral reef in Okinawa’s Sekiseihoko are is dead from coral bleaching (The Japan Times 2017). At the seawall construction side, a rare and endangered coral was found (Kyodo News 2017). This coral has been removed and relocated in order to ensure its protection, but this is a stark reminder of the kind of damage the US military base expansion can have to the marine life and ecosystem of the ocean which is already severely threatened due to warming sea temperatures. According to Global Research (2017), all components of the notorious defoliant Agent Orange have been found on Okinawa, and there is evidence that it was used throughout the island, despite the Pentagon denying this fact. In 2015, it was discovered that surrounding waters were highly contaminated with the poison dioxin. This adds another layer of controversy when it comes to the presence of US military forces in Japan, and particularly on Okinawa. Project Details The design of the Futenma Replacement Facility is based on the bilateral agreement between Japan and the U.S., "United States-Japan Roadmap for Realignment Implementation" (2006). Japan agreed to construct the facility. It is to be V-shaped runways, each with about 1,800 meters in length. The runways extend over the peninsula of the Camp Schwab site between Henoko Bay and Oura Bay. The construction of this facility will require about 160 hectares of marine area with 2,100 cubic meters of soils for landfill. This construction will affect about 78.1 hectares of sea grass bed and about 6.9 hectares of coral area. The beach area of the Camp Schwab will be completely destroyed. Development of Alternatives Futenma Base can be removed to Guam (which belongs to US) without building a military facility at Henoko. Why? Explain briefly. The issue is on-going. Okinawa governor has maintained a strong position against the Henoko plan. 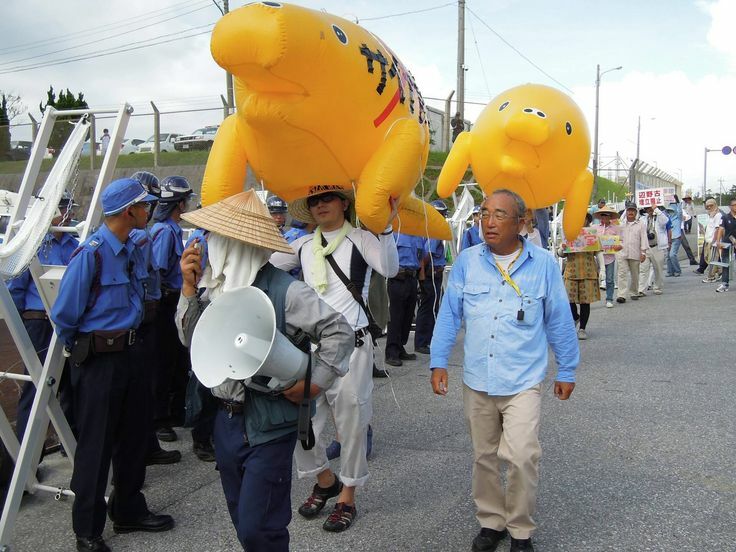 He is backed by a large number of Okinawa residents. However, Prime Minister Shinzo Abe and his followers have been putting increasing political pressure on Okinawa governor to accept the Henoko plan. The Japan Federation of Bar Associations issued a request for the protection of the Okinawa dugong in 2000. Asahi Shinbun 2017a, "Kayak protest in Okinawa held after 6 months of U.S. base work"
Kyodo News 2017, "Japan begins constructing more seawalls for new U.S. base in Okinawa"
Asahi Shinbun 2017b, "New building work begins at site for U.S. base in Okinawa"
The Japan Times 2017, "Okinawa to see work start on two new Futenma seawalls next week"
Global Research 2017, "Agent Orange on Okinawa: Six Years On"
Henoko Bay Looking at the Camp Schwab site from Henoko Bay beach. December 2011. Photo by the author.